BF said he hated ill fitted tack and M-5 does some leather work. I refuse to spend a bunch on a bosal hanger so I bought this headstall but I don't know how to attach the fiador without it looking like I did it. Any ideas that look like it was made for it and done right ? Photobucket is being uncooperative at the moment. I'll show a pick of something simple I make. Yours looks fine to me though. I'd probably start by turning the headstall around first. Then I'd get an extended Chicago screw and a scrap of thin latigo leather about half inch wide. 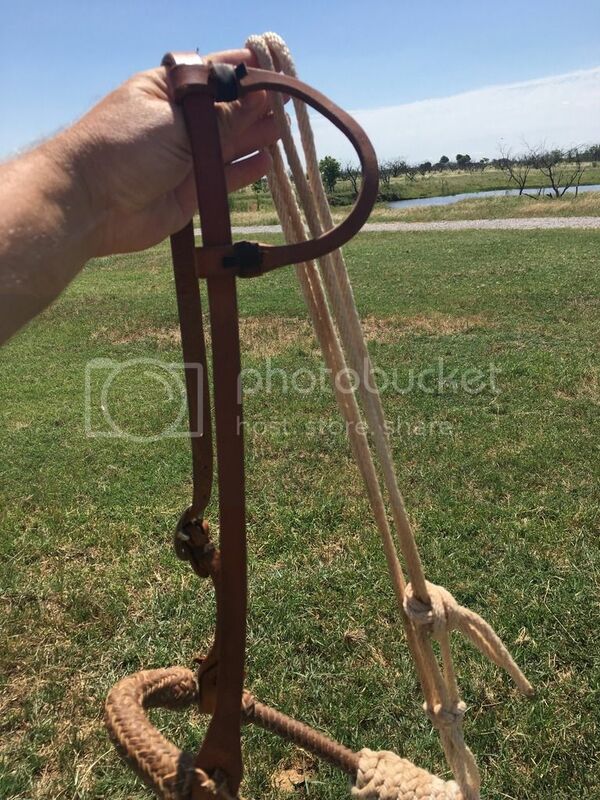 Take a wrap around headstall, make a mark for a hole thru the end of the latigo and where the screw hole needs to be in the tag end to hold the headstall tight. Then, make a loop just big enough for the fiador, to hold it snug, and back to the hole, cut to length. So, you end up with one piece of leather, a hole on each end of it, and a hole in the middle. Kind of like a figure eight if you will. It will hold it tight enough not to slip if done correctly, and looks fine enough. Last edited by talltimber on Sun May 28, 2017 2:06 pm, edited 2 times in total. I make a lot of nosebands. I always do this simple little braid. Pay no attention to the crappy weld on this bit. After it, I went back to my preferred metal sweet iron. 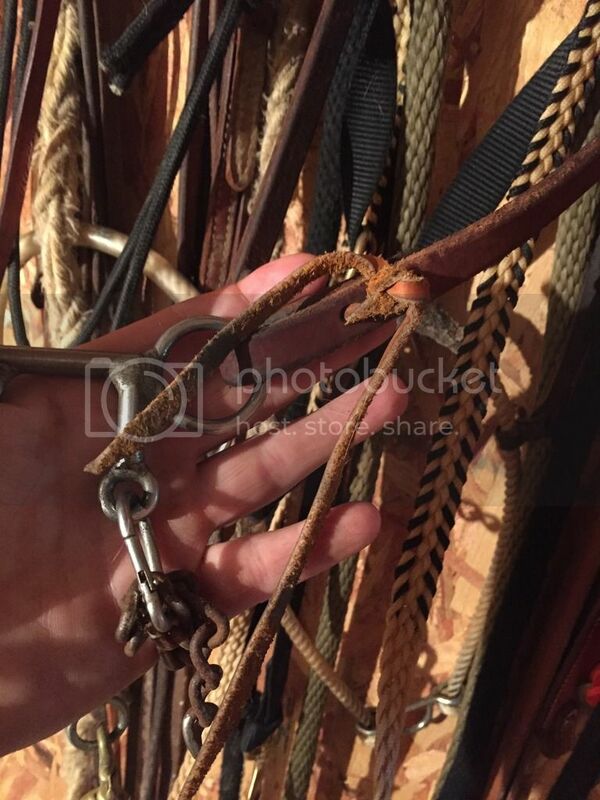 I always do my headstalls like this, and would probably hang a bosal the same way. 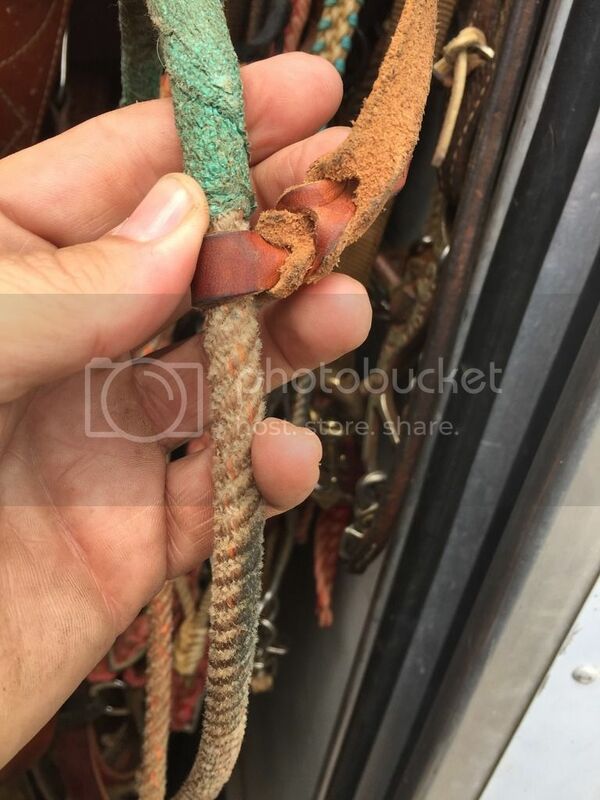 I have also butchered a rope halter for a bosal hanger as well. I like what you did though (if I'm seeing it correctly). talltimber wrote: I'd probably start by turning the headstall around first. Sorry just seen this. The braid bf shown is the simplest if you don't have hole punch .